Will Goldman Sachs Raise Its Dividend in 2017? The investment banking giant has seen its stock soar lately. Will investors also get a dividend boost? Love it or hate it, Goldman Sachs (NYSE:GS) is the most important stock in the Dow Jones Industrials right now, and it has been on fire recently. With the highest share price among the Dow 30, Goldman is responsible for more than 8% of the value of the price-weighted index, and that gives it more power over the movements of the Dow than the six cheapest Dow stocks combined. That said, dividend investors aren't all that happy with Goldman Sachs, because its current dividend yield is puny, resting just above the 1% mark. Shareholders would like to see a considerable boost to that figure this year. With that in mind, let's take a closer look at Goldman Sachs to see whether it will raise its dividend in 2017. 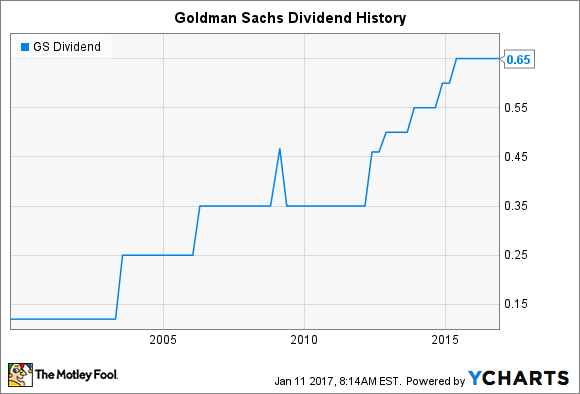 Goldman Sachs has a long history of paying out dividends, and its recent dividend growth has been fairly impressive. Since 2012, the company has made five increases to its quarterly payout, and all told, that has sent the dividend up by more than 85% over that timeframe. Unlike many financial stocks, however, Goldman has never sought to have a particularly attractive dividend. The first dividend it paid as a publicly traded stock amounted to a yield of less than 1%, and there have only been a couple of occasions when the investment bank very briefly exceeded the 2% yield level. Indeed, for most of its history, Goldman's yield was well below 1%, and only with the recent decisions to accelerate its dividend growth dramatically has the stock's yield gotten much healthier. GS Dividend data by YCharts. The reason for this is fairly simple: Goldman has a different priority list when it comes to how it deploys its capital. The company has noted on multiple occasions that although dividends have increased over time, stock repurchases represent the vast bulk of its return of capital to shareholders. Goldman takes a dynamic approach to its buybacks, and it has also told investors that they shouldn't view buybacks as being the same as dividends, because the bank takes a different view of the two methods of returning capital. In addition, the company also reserves plenty of capital to deploy back into its banking business. That said, Goldman has plenty of earnings that it could use to boost its dividend if it wanted to. Right now, Goldman's payout uses up just over a fifth of its earnings capacity. That's significantly lower than most of its financial industry peers, giving it room for further moves higher in the future. Will Goldman raise its dividend in 2017? Yet the biggest question for Goldman Sachs is why it hasn't raised its dividend already. Last June, the company said that it had gotten approval from the Federal Reserve for its 2016 capital plan, which it said "includes the repurchase of outstanding common stock, an increase to its quarterly stock dividend, and the possible issuance and redemption of other capital securities." Yet no dividend increase has actually taken place. That question came up during Goldman's third-quarter conference call last July. CFO Harvey Schwartz responded, "What we intended to communicate was that the approval gave us the flexibility to do all those things, but we weren't speaking specifically to any decision-making to the dividend." As a result, it's unclear whether Goldman Sachs will actually raise its dividend in 2017. Having already had the permission of the Fed to do so, Goldman's decision not to boost its quarterly payout reemphasizes the fact that buybacks are its favored way of returning capital to shareholders. Even though dividend investors might be disappointed with Goldman's stinginess, shareholders who've enjoyed the stock's nearly 50% jump over the past year probably aren't complaining much about it.